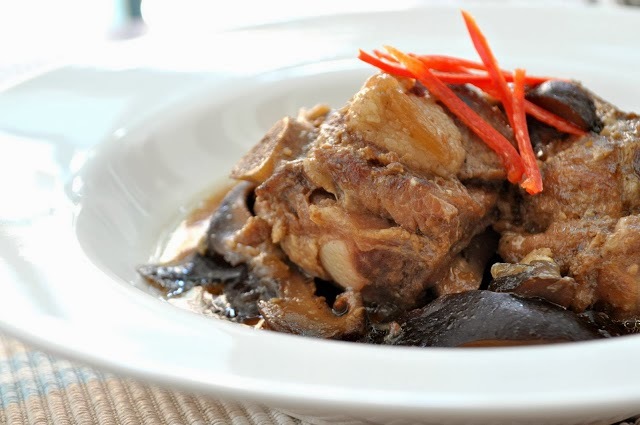 Babi Chin or Fragrant Nyonya Pork gives justice to its name for your kitchen and the whole family will definitely have the I-want-to-eat-now feeling because of its aroma. The flavors are not too strong, just right for you to have another spoonful for you can't get enough. 1. Soak the dried shitake mushrooms in water to soften, squeeze excess liquid then cut into strips. 2. Over medium flame, heat oil in a sauce pan and fry shallots until fragrant, add garlic and saute for 1 minute. 3. Add star anise and coriander. Cook for another minute. 4. Add your mushrooms and pork. Fry for 2 to 3 minutes or until pork looses its outer pink color. 5. Add soy sauce, sugar, pepper and water. 5. Bring to boil then reduce to simmer. Cook covered for 1.5 hours (or until pork is very tender) stirring occasionally to prevent from burning.